Susanna has been working most evenings for the past two weeks. She heads into work before I get home, and returns about when I would normally go to bed. So, I’ve been staying up later than usual. So, I’ve been a little tired when I get home from work. The boys are at their mother’s house tonight and tomorrow night, so I was planning on taking some time to get ahead on projects in the workshop after dinner. 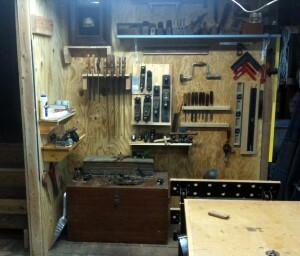 The back wall of the workshop - I need to rearrange and reorganize the storage on that wall this winter. I couldn’t get motivated to actually make sawdust today; instead I spent some time cleaning and organizing the workshop. 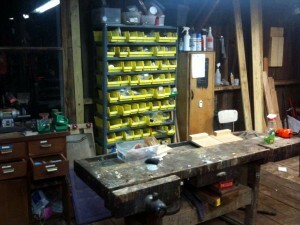 The shop is now about as clean as it ever gets – which means I’ll have to start working to make it dirty again. 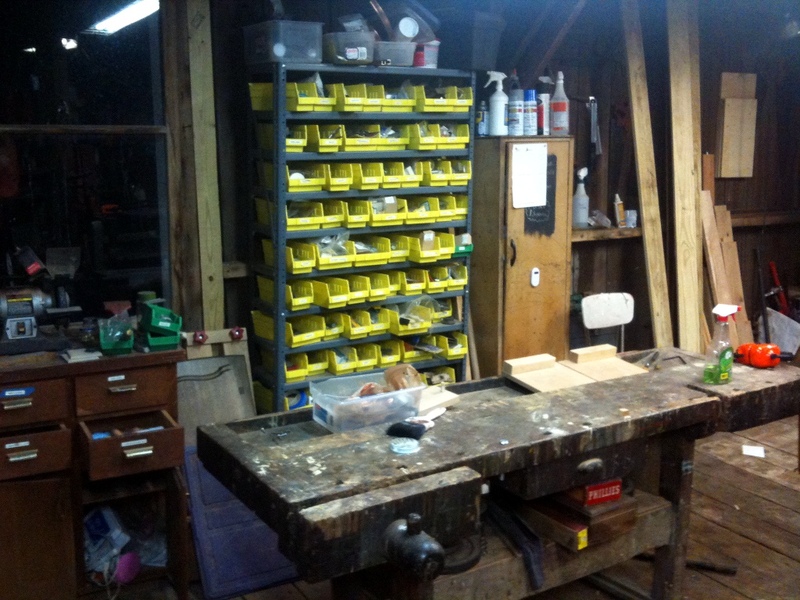 I rearranged the workshop this year, and am in general very pleased with the layout. There are two problems with the shop currently. The first is that I don’t have a good place to store the wood that I am currently using for a given project. The second is the back wall of the shop. I think I need to rearrange the storage on that wall a bit to make the space more useful. I’m still not sure how I would arrange the back wall. Maybe I’ll move the lathe to the back wall, and move the storage shelves to fit where the lathe is currently. The major improvement I made to the workshop storage this year was the hand tool storage wall. I am still tweaking the hand tool storage wall, but overall I am very happy with it. I’m also pretty sure I’ll continue to add small improvements to my hand tool storage as I use the workshop. Tonight I added a second shelf on the left that holds my “guest tools” – or the loaner tools, so I don’t have to loan out my good hand tools.